You and the equipment are the package! The most important pieces of equipment are the boots, because they are the levers, the extensions of the feet that transmit your athletic movement to the skis. They should snugly support your feet, without discomfort. A footbed in the boot, made for you and set up by an alignment specialist, can correct the asymmetrical differences that we each have in our bone structure. With the process of setting up the boots done, you are able to roll both skis onto edge at the same time, from a centered stance. A blessed event. The easiest part of the equipment package, to get right, are the poles. They help define the spatial relationship of the upper body, through the hands, to the snow. We are often given poles that are too long, or bottom heavy, causing us to raise our hands and move our shoulders up and back, to keep from inadvertently dragging the poles in the snow as we ski. Some poles have adjustable lengths, but the same thing can be accomplished by moving your grip up or down, or having your poles cut down in the local ski shop. These are quick, easy on the budget, solutions. With balanced poles, the right length for you, it’s easier to start the new turn with a pole swing that’s natural and accurate. So much is written and said about the new skis, that I’ll just say go for a good shaped ski. Whether you are renting or getting your own skis tuned, ask a couple of the local ski pros in your area where they take their own skis to be tuned. The new skis are all so good, that tuning may make the biggest difference affecting your enjoyment, by allowing the ski to react predictably. 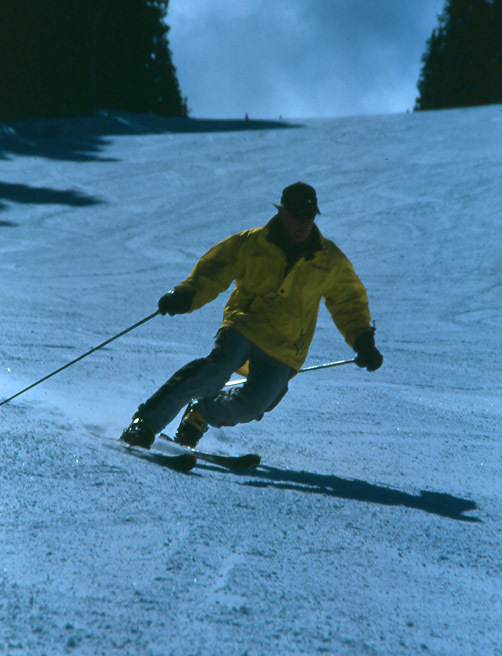 When you SKI IN HARMONY® you are not using your athleticism to compensate for poorly adapted equipment. Poles that swing easily, comfortable, aligned boots, and a well tuned ski unconsciously become part of you.